It is a great idea to distribute posters in the workplace that are descriptive norms pertaining to the business. A simple yet effective way to reduce workplace fraud, waste, and abuse. Need some ideas? Check out these posters: 1, 2, 3, 4. ISO 19600:2014 provides guidance for establishing, developing, implementing, evaluating, maintaining and improving an effective and responsive compliance management system within an organization. ISO 19600:2014 is based on the principles of good governance, proportionality, transparency and sustainability. ISO 37001:2016 specifies requirements and provides guidance for establishing, implementing, maintaining, reviewing and improving an anti-bribery management system. The system can be stand-alone or can be integrated into an overall management system. ISO 37001:2016 addresses the following in relation to the organization’s activities: bribery in the public, private and not-for-profit sectors; bribery by the organization; bribery by the organization’s personnel acting on the organization’s behalf or for its benefit; bribery by the organization’s business associates acting on the organization’s behalf or for its benefit; bribery of the organization; bribery of the organization’s personnel in relation to the organization’s activities; bribery of the organization’s business associates in relation to the organization’s activities; and direct and indirect bribery (e.g. a bribe offered or accepted through or by a third party). ISO 37001:2016 is applicable only to bribery. It sets out requirements and provides guidance for a management system designed to help an organization to prevent, detect and respond to bribery and comply with anti-bribery laws and voluntary commitments applicable to its activities. ISO 37001:2016 does not specifically address fraud, cartels and other anti-trust/competition offences, money-laundering or other activities related to corrupt practices, although an organization can choose to extend the scope of the management system to include such activities. ISO 31000:2018 provides principles, framework and a process for managing risk. It can be used by any organization regardless of its size, activity or sector. ISO 31000:2018 can help organizations increase the likelihood of achieving objectives, improve the identification of opportunities and threats and effectively allocate and use resources for risk treatment. ISO 26000:2010 provides guidance to all types of organizations, regardless of their size or location, on: concepts, terms and definitions related to social responsibility; the background, trends and characteristics of social responsibility; principles and practices relating to social responsibility; the core subjects and issues of social responsibility; integrating, implementing and promoting socially responsible behavior throughout the organization and, through its policies and practices, within its sphere of influence; identifying and engaging with stakeholders; and communicating commitments, performance and other information related to social responsibility. ISO 26000:2010 is intended to assist organizations in contributing to sustainable development. It is intended to encourage them to go beyond legal compliance, recognizing that compliance with law is a fundamental duty of any organization and an essential part of their social responsibility. It is intended to promote common understanding in the field of social responsibility, and to complement other instruments and initiatives for social responsibility, not to replace them. ISO 31000:2018 provides guidelines on managing risk faced by organizations. The application of these guidelines can be customized to any organization and its context. ISO 31000:2018 provides a common approach to managing any type of risk and is not industry or sector specific. ISO 31000:2018 can be used throughout the life of the organization and can be applied to any activity, including decision-making at all levels. ISO 30408:2016 provides guidelines on tools, processes and practices to be put in place in order to establish, maintain and continually improve effective human governance within organizations. ISO 30408:2016 does not address relations with trade unions or other representative bodies. 3. Denial of the victim. This can also come from a feeling of being undercompensated. 4. Condemnation of the condemners. Including questioning government motivation in bringing the charges. 5. Appeal to higher loyalties. “I did it for my family” is one of the most popular excuses for occupational crime. Considering illegal conduct can give an unfair competitive advantage to the perpetrator, rivals may feel pressured to follow suit. Business leaders / ethics training must deal with these rationalizations, and create an environment in which such behavior are not accepted. 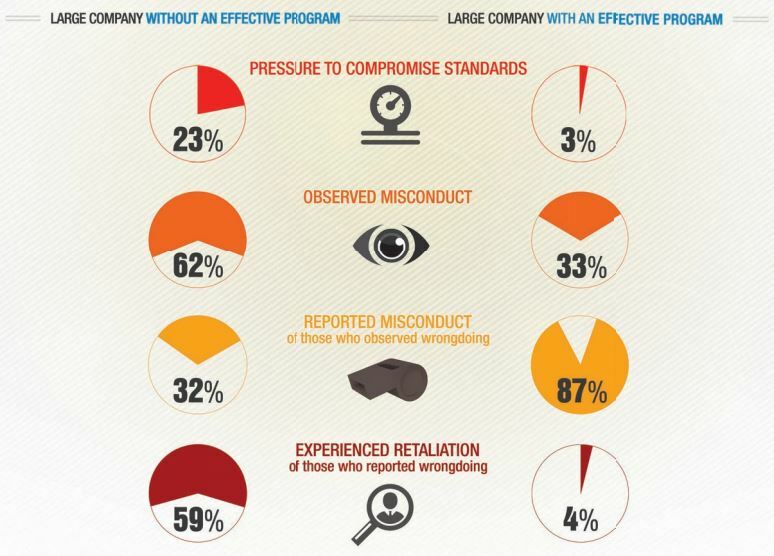 What it means for organizations: Invest sufficient resources to monitor behavior at every operating location and to develop ethics and compliance (E&C) programs designed around a common code of conduct. Include strategies to protect against retaliation – such as ready-access to an ethics hotline with a clear non-retaliation policy. The Gallup Survey Report, “State of the American Workplace: Employee Engagement Insights for U.S. Business Leaders” defines engaged employees as those who work with passion and feel connected to their organizations. How would your employees respond to these 12 statements? 8. The mission or purpose of my company makes me feel my job is important. 9. My associates or fellow employees are committed to doing quality work. 10. I have a best friend at work. 11. In the last six months, someone at work has talked to me about my progress. 12. This last year, I have had opportunities at work to learn and grow. MYECCHO makes getting an Ethics Hotline affordable for smaller companies too! Business torts are civil wrongs that are committed by or against an organization. “One of the most pervasive business torts is intentional misrepresentation. 1. The wrongdoer made a false representation of material fact. 3. The innocent party justifiably relied on the misrepresentation. Liability for harm as a result of foreseeable consequence. Liability without fault “is imposed for abnormally dangerous activities” such as storage of explosives and keeping of pets. Crimes prone to be committed by businesspersons are referred to as white-collar crimes. Fradulent making or alteration of a written document that affects the legal liability of another person. Examples: counterfeiting, falsifying public records, materially altering legal documents. Fradulent conversion of property by a person to whom that property was entrusted. Bribery is one of the most prevalent forms of white-collar crime. Giving of money, property, favors, or anything else of value for a favor in return. Threat to expose something about another person unless that other person gives money or property. Obtaining title to property through deception or trickery.